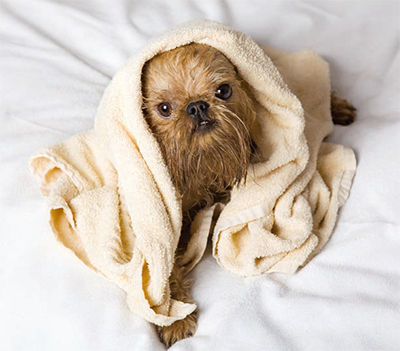 The Griffon Bruxellois is known for its cute monkey-like expression and keen sense of self-importance. They make excellent companions due to the manner in which they bond closely with an individual; although once the bond has been made the Griffon Bruxellois will not enjoy any time apart from their owner, an excellent choice for older families. Looking a little like the cross between a terrier and a monkey, the lively (and often noisy!) Griffon Bruxellois was bred as a small but effective vermin killer. Very quickly, they became the pest control experts of Belgium, working in the city stables and gaining a very impressive reputation. They have a real rags to riches story, however, as Queen Marie Henriette of Belgium discovered the breed working in the stables and fell in love with them — so from humble beginnings, they transformed into the dogs of nobility. Obedient yet independent. The Bruxellois will carry themselves in a proud manner but does have a reputation as being a sensitive breed, not responding well to loud, chaotic environments or repetitive, negative training process. They may not be suitable for households with young children as they can be quite disturbed by over-zealous handling. Their socialization should be thorough and on going to avoid any lapses into negative behaviour. The Griffon is a perfect companion, much more outgoing and hardy than some of his flat-faced toy cousins. The breed is vocal, active, full of energy and is quite fearless with larger dogs. The Breed Standard specifies a weight of between 3-5kg; the height should appear equal to the length giving a sense of proportion. The Griffon body should be chunky, cobby and solid, with straight forelegs, a level back, and a well-angulated rear. Another breed for whom their compact muzzle can cause breathing difficulties. They are also prone to eye conditions so care should be taken to keep them clear of hair and dirt on a regular basis. When the Griffon is a puppy it is key that you keep a close eye on their teeth, you need to ensure that when the second teeth come through, the baby teeth are shedding properly. The first teeth can be reluctant to leave and this may result in a double row of teeth developing. Pay regular attention to their eyes and ears, making sure they are free of excess hair. 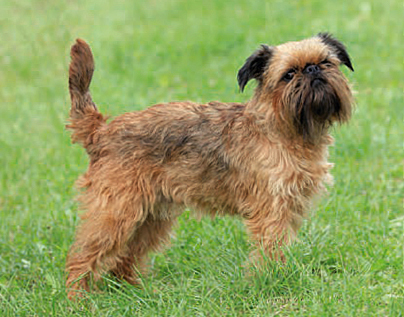 The Griffon Bruxellois has two alternative coats: rough-coated or smooth. The rough coat needs daily grooming, especially around the face, and should be stripped twice a year to allow the new coat to grow through. This should be done by hand, and breeders will advise on coat preparation.